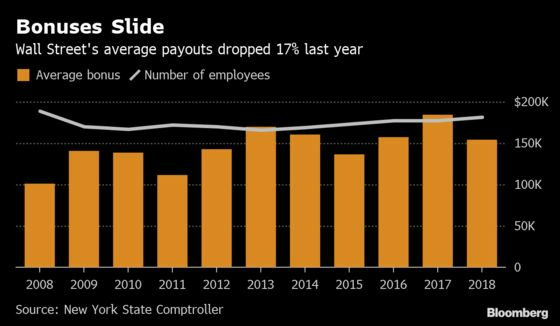 (Bloomberg) -- Wall Street’s average bonus fell 17 percent in 2018 to $153,700, the first decline in three years, according to estimates by New York State Comptroller Thomas DiNapoli. The bonus pool dropped 14 percent to an estimated $27.5 billion as employment in the industry increased in New York City, DiNapoli said Tuesday in a statement. Bonuses fell even though pretax profits from broker-dealer operations of New York Stock Exchange member firms advanced 11 percent. While DiNapoli didn’t break out bonuses by business lines, equities traders probably fared best, based on forecasts in November by pay consultant Johnson Associates Inc. Fixed-income traders and merger advisers were probably among the list of losers for 2018, according to the estimates. Trading firms were rocked by a volatile fourth quarter that left many investors on the sidelines. U.S. stocks fell by the most in seven years and trade tensions flared. Bad news on pay may continue this year. Compensation including bonuses and salaries for 2019 is likely to fall as pressure to lower fees and volatile markets weigh on firms’ revenue, Johnson Associates said last month. The employment figure was the highest level in a decade. Wall Street has been beefing up staffing levels in technology and compliance divisions.